My approach to teaching the golf swing consists of paying attention to key fundamentals in the swing. All the pros on tour do not have swings that look exactly alike, but they all tend to have great fundamentals and have similar elements in their swings related to these fundamentals. Golf is hard enough and my job is to make the game as easy as possible. Most students don't have all day to work on their golf swing technique like the pros do. That's why I have found that simplifying the golf swing is very important. The simpler your swing is, the easier it is to be consistent. If you have a lot of extra movement going on in your swing, you'll have to compensate and rely a lot on timing which requires more practice. A swing that is more compact, connected, and on plane will allow you to be much more consistent. This means if you can't practice everyday or take time off from golf, you won't feel like you've lost your swing the next time you go out to the course. I am very thorough and will make sure you build a good foundation with your golf swing so you can get the most out of it and play great golf for many years. I try to teach students how to self-correct so you won't need to rely on me forever but may occasionally just need a tune up lesson. Some of the topics I like focusing on are the setup fundamentals including grip, stance, posture, ball position, alignment, the swing path/plane, the concept of staying level for most of the swing, the weight shift and how to turn correctly, swing sequence, how the wrists work in the swing, and tempo. Checkpoints are a big part of my teaching style. I like to explain exactly where you need to be with your golf swing instead of just fixing one problem which can lead to another or even the opposite problem. For example, if a golfer comes to me with a swing plane that is too flat, I not only explain and show them how to get steeper but I give them the checkpoint for how to get exactly on plane and where they ideally want to end up with their swing plane. There are a lot of different swing models and methods that can work if you practice a lot. I have found through my ten years of teaching experience that working with a golfer's natural swing and integrating correct fundamentals into it will help them make improvements at a faster rate than trying to fit them into a certain swing model. Practicing something enough will often make a golfer get better but if you know the direct route to successful golf, it's much, much faster and way more enjoyable. 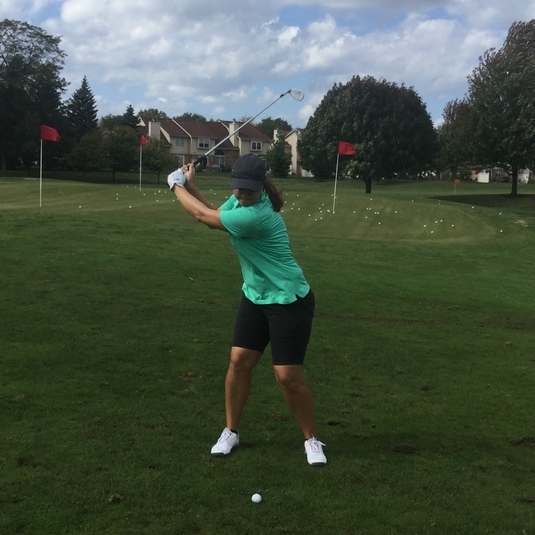 If you want to make significant improvements in your golf game, you need an instructor who knows how to separate the most important things you need to be working on and give them to you in the right order. This is really a big key to improving. My teaching method is perfect for anyone but geared towards weekend players who want a simple understanding of their swing and practical solutions for how to lower their scores and get better faster without needing to spend months or even years trying to do it. I believe each lesson should make the student get better and someone working with me can expect significant improvements in their golf swing and their game after each lesson. Most of my students see pretty dramatic improvements in their swing and game after just a few lessons. Call me today to set up your next golf lesson at 630-781-5622. Or you can reach me by email at golfgrl83@gmail.com. I look forward to helping you with your golf game! "After three lessons I have never hit the ball better. Thank you." "Great teacher! Sarah saw right away what I needed and her approach is very effective. Highly recommend!" "Sarah is always a pleasure to work with and is never anything but professional. She has helped me improve my game and I plan to continue working with her."